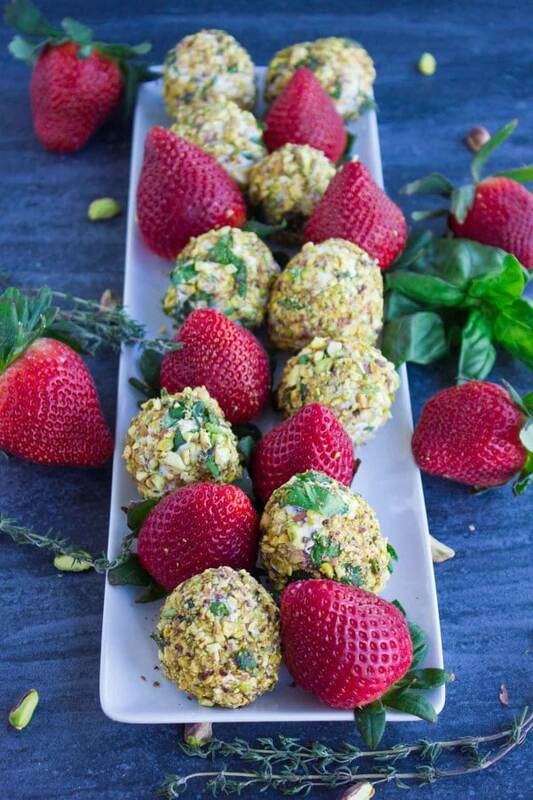 This recipe for Goat Cheese Pistachio Coated Strawberries is perfect for any festive occasion in spring and summer that requires a refreshing appetizer or some easy finger food. 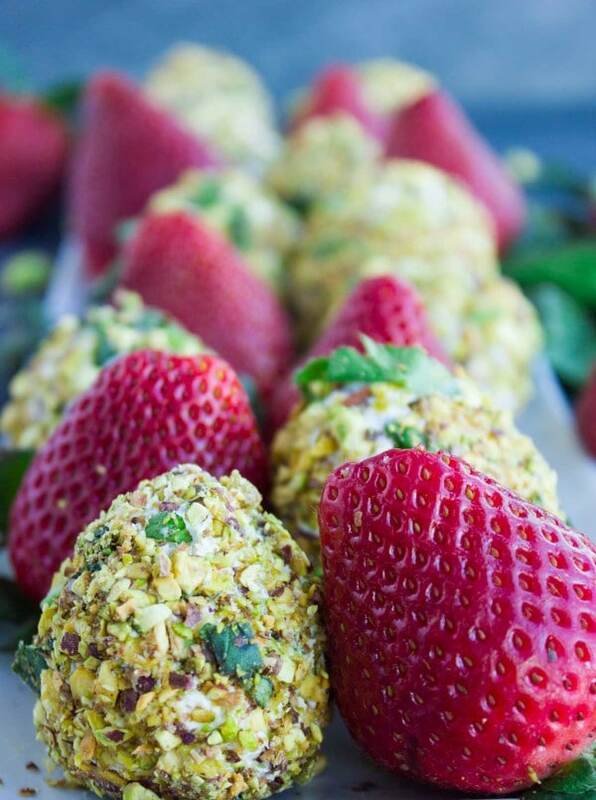 This recipe for Goat Cheese Pistachio Covered Strawberries is every goat cheese lovers’ dream, every fruit and cheese lovers’ dream, every finger food lovers’ dream…every foodies’ dream! 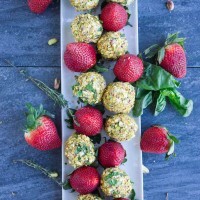 This recipe for Goat Cheese Pistachio Covered Strawberries is perfect for any festive occasion in spring and summer that requires a refreshing appetizer or some easy finger food. This simple yet delicious healthy appetizer will surely impress everyone! For this easy goat cheese appetizer, creamy goat cheese is flavored with fresh thyme and honey. 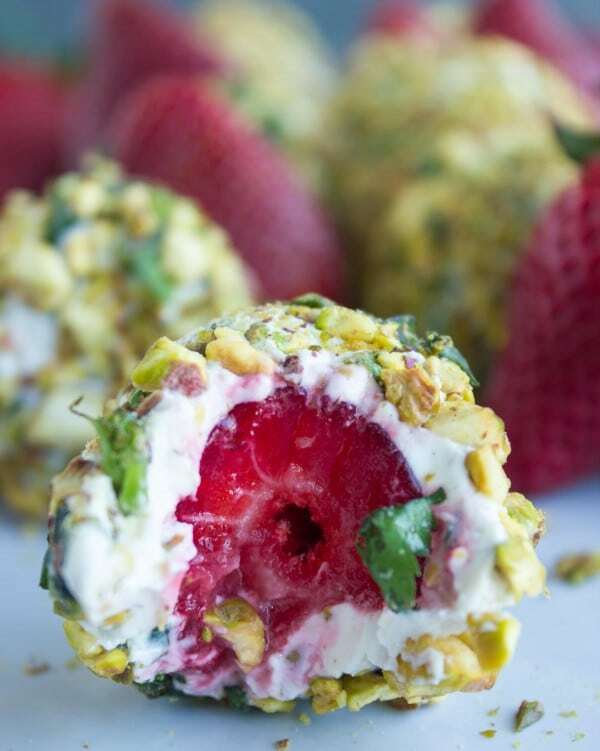 Then, a strawberry is coated in this creamy cheese mixture and rolled in a fragrant coating of crushed pistachios and fresh basil. Need I say more? Goat cheese is the perfect candidate for coating fruit because of its’ smooth, creamy texture. It is pliable when cold and it firms up nicely when chilled and holds its shape around the strawberries. This easy recipe starts with softening up the goat cheese with a fork and seasoning it with a pinch of salt, fresh herbs and a tiny drizzle of honey. Then take a small size ball (just a little smaller than a golf size ball) of the cheese mixture and flatten it on the palm of your hands. 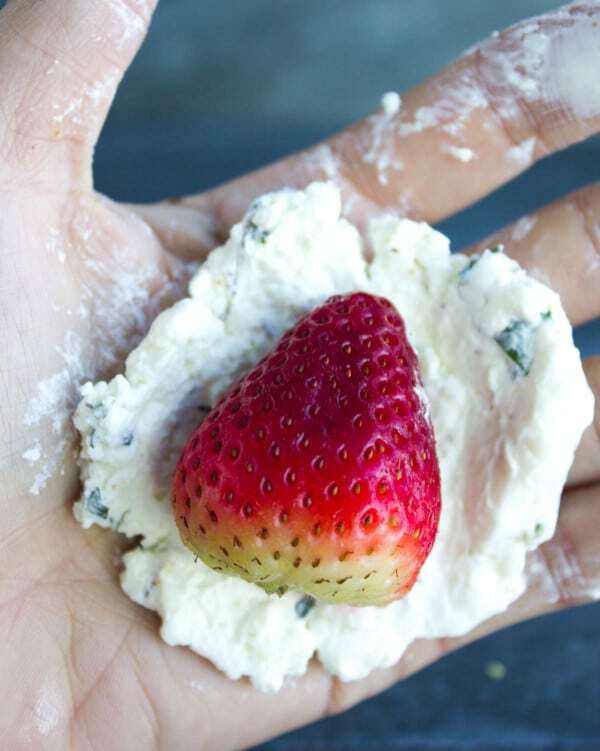 Place one strawberry in the center and then gently wrap the cheese all around it to cover the whole fruit entirely. The beauty about covering the strawberries with goat cheese is, that it doesn’t have to be perfect. It will get all covered up in nuts anyways! So don’t overthink this step or waste time perfecting it. 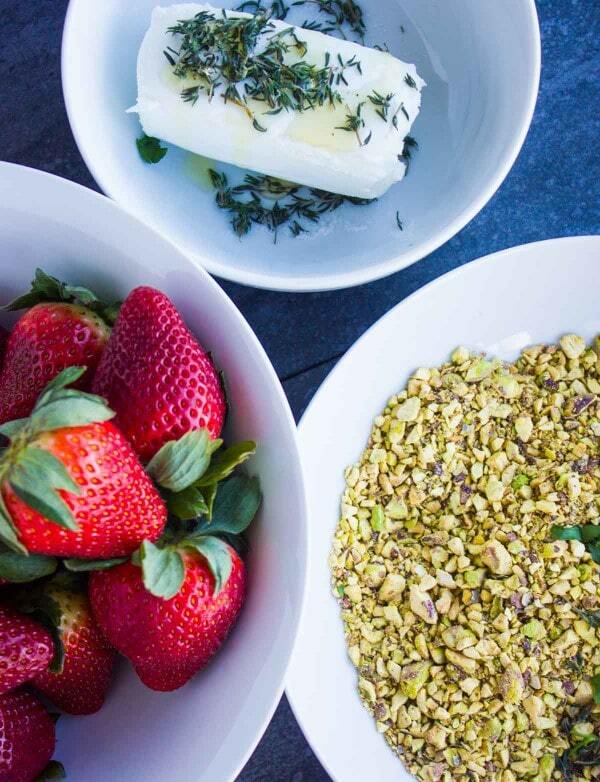 Dip the goat cheese covered strawberry into the pistachio-basil mixture and roll it around. Place the Goat Cheese Pistachio Covered Strawberries on a plate in a single layer and chill them until it’s time to serve. 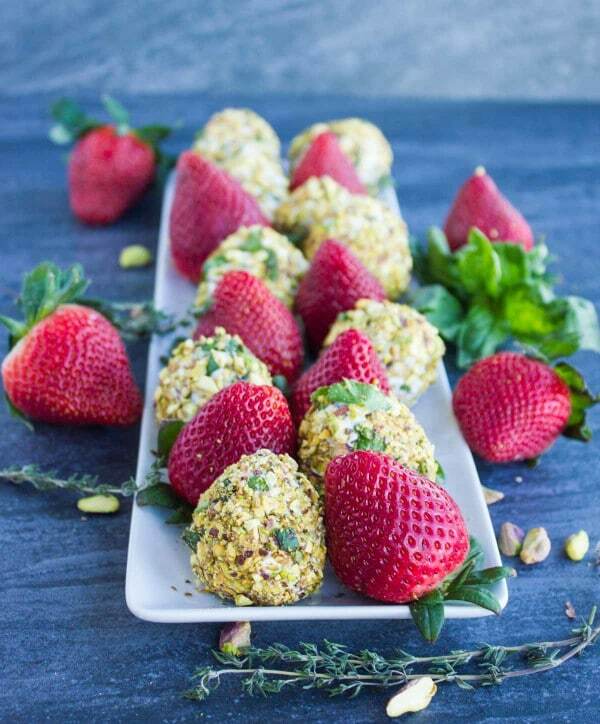 This recipe for Goat Cheese Pistachio Covered Strawberries is a must try and a great appetizer recipe you will find yourself trying with different fruit-cheese-nut and herbs combinations. 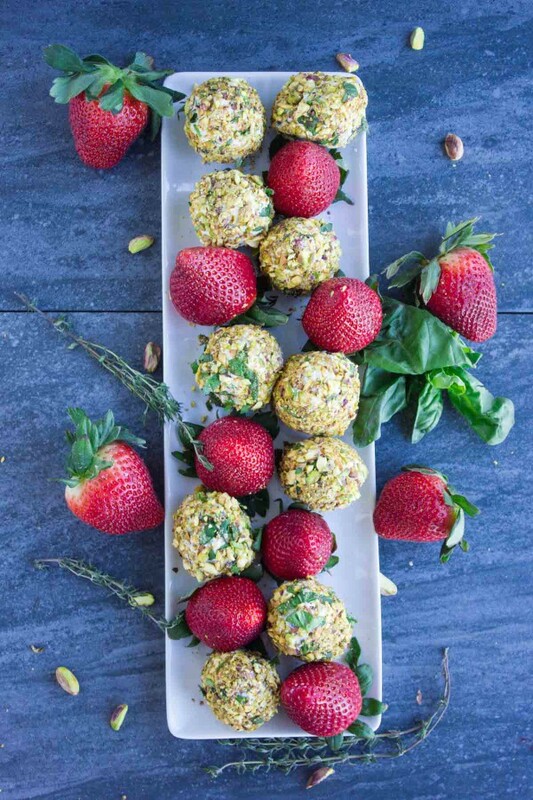 These Goat Cheese and Pistachio Covered Strawberries are best when chilled for an hour after they’re done so that the cheese can firm up. Choose ripe but not overripe strawberries that are firm and uniform in size. The smaller the better. Serve this easy appetizer with crunchy baguette slices or on their own. I chose strawberries for this appetizer recipe, but it would also work well with melon balls or grapes too. Choose a fruit that holds its shape well and does not lose too much water. If using a different fruit, feel free to play around with the herbs! Mint and melon is a great combination, or try teaming up grapes and parsley. Substitute pistachios with any other chopped nut like almonds, walnuts or pecans. They all taste terrific in this simple goat cheese appetizer recipe. 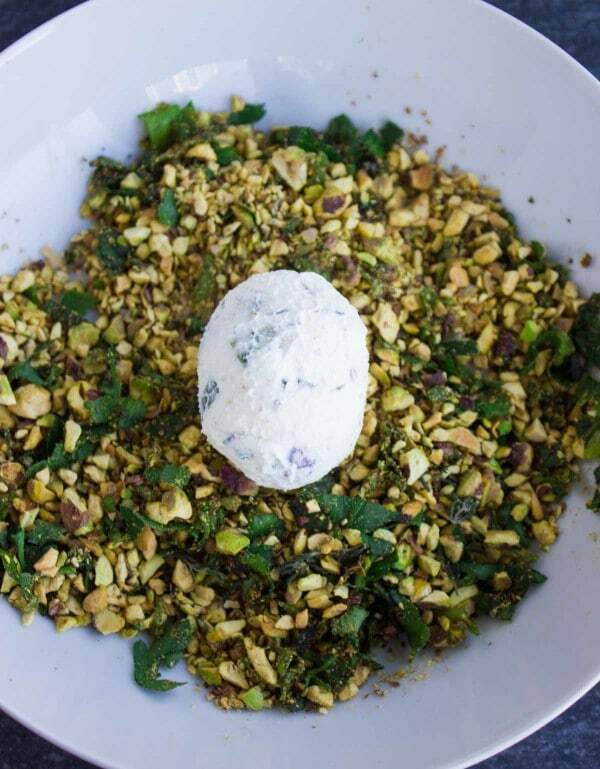 Should you be a fan of goat cheese, try a mix of cream cheese and feta or blue cheese. The cream cheese is necessary to make the cheese malleable and creamy. In a small bowl, mash the goat cheese with a fork to soften it up and season it with salt, pepper, thyme and honey. Mix it well and set aside. Mix the pistachios and fresh basil in a separate wider bowl and set aside. Place one strawberry in the center of the cheese and use both hands to carefully fold the cheese around the strawberry and begin rolling it around. This doesn’t have to be perfect or even, as long as all the strawberry is covered up with a thin layer of goat cheese. OHH my GOD! Seriously i am trying hard to imagine how delicious this could be untill i get all my ingredients from the supermarket tomorrow and try this! Cant stop thinking about it! Looks delicious and mouthwatering indeed! Shahi, thanks! 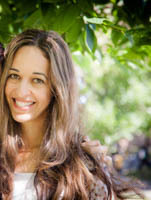 :):) Love your energy! Hope you make them soon!! Three letters OMG this is amazeballs. Perfect perfect perfect. I cannot wait to make these. These look so pretty and delicious. The pairing of herb, fruit, cheese n nuts are always the best! How far in advance can you make these? I wanted to serve at a party but would like to make the day ahead. Thanks so much Ksenia! Fabulous collection! Hi!! This looks delicious. I am wondering how many of these count as a serving? It says the whole recipe is 8 servings…. Are the pistachios roasted and salted? Trying to make this to serve in a few hours.